BEER-SHEVA, Israel…November 27 – A new, long-term diet study published in the high impact American Heart Association journal, Circulation, used MRI imaging technology for the first time to plot the diverse changes in an array of body organ fat storage pools during 18 months of Mediterranean/low-carb (Med/LC) and low-fat diets, with and without moderate physical exercise. 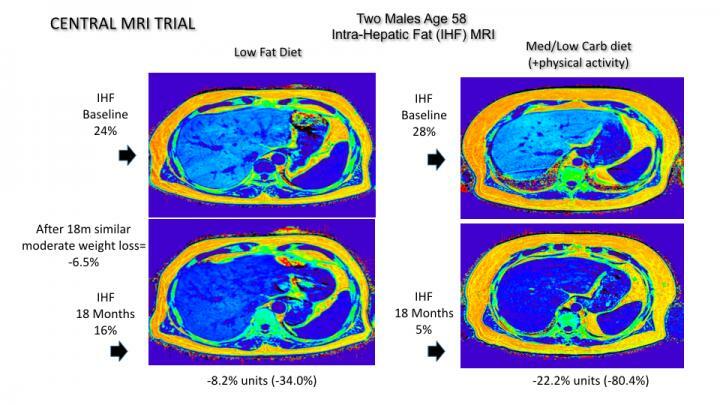 "Weighing patients or using blood tests to detect changes, hasn't, until now, given us accurate pictures, literally, of how different fat deposits are impacted disproportionately by diet and exercise," says Prof. Iris Shai, the primary investigator of the CENTRAL MRI trial. "These findings suggest that moderate exercise combined with a Mediterranean/low carb diet may help reduce the amount of some fat deposits even if you don't lose significant weight as part of the effort." "We learned in this trial that moderate, but persistent, weight loss may have dramatic beneficial effects on fat deposits related to diabetes and cardiovascular diseases," Prof. Shai explains. A Mediterranean diet, rich in unsaturated fats and low in carbohydrates, was a more effective strategy than an iso-caloric low-fat diet to dramatically reverse morbid fat storage sites. "In conclusion, the CENTRAL study demonstrates that improving nutritional quality and being physically active can improve cardio-metabolic risk markers through changes in visceral/ectopic fat deposits that are not reflected by changes in body weight alone," Prof. Shai says. CENTRAL MRI Research Group: Iris Shai, Yftach Gepner, Ilan Shelef, Dan Schwarzfuchs, Assaf Rudich, Meir J. Stampfer, Hila Zelicha, Lilac Tene, Anat Yaskolka Meir, Gal Tsaban, Noa Cohen, Nitzan Bril, Michal Rein, Dana Serfaty, Shira Kenigsbuch, Oded Komy, Arik Wolak, Yoash Chassidim, Rachel Golan, Hilla Avni-Hassid, Avital Bilitzky, Benjamin Sarusi, Eyal Goshen, Elad Shemesh, Yaakov Henkin, Michael Stumvoll, Matthias Blüher, Joachim Thiery, Uta Ceglarek.